First things first. Any news regarding the grand daughter? Trust everything is OK in Brazil. Secondly, it is fantastic news that the book is progressing. Thirdly, went down to Whangamata on Saturday. Low tide was at 8.00 pm which meant that I could fish dusk and dawn. Bonus! As soon as I hit the channel on Saturday evening I knew I was going to catch fish. There were lots of smelt and yellow eyed mullet ghosting in the margins and numerous stingrays cavorting about (mating?). Perfect conditions to cast long as the 20 knot W wind was at my back. My first cast flew ¾ away across the estuary with the tail wind and was intercepted by a ravenous horse mussel within seconds of touch down. "Sod it!" I mumbled as I re-tied on another trace. Cast #2 was spanked by a 31 cm snapper and cast # 4 was slaughtered by a 34 cm snapper which fought like a dervish and pulled a decent amount of string. I fished until a horse mussel removed my cast again so was home at Hazel’s within an hour with a brace for dinner. 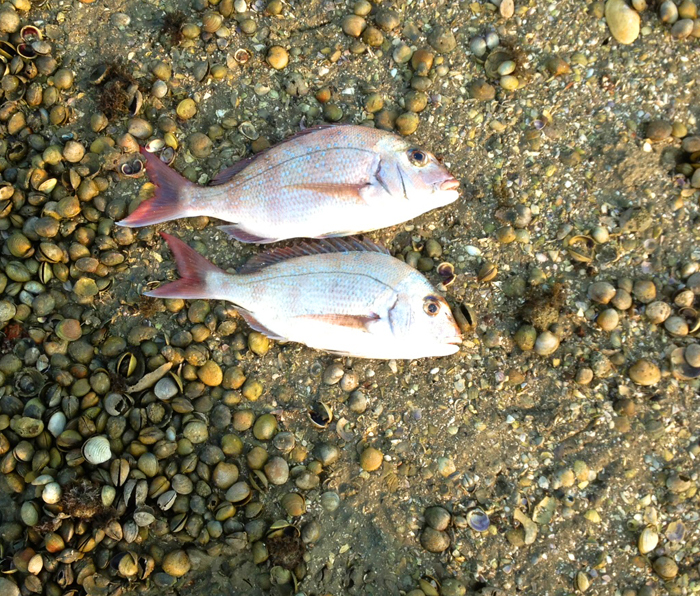 Both snapper nailed a 2” PowerBait on a ¼ oz. Nitro jig head. Cast out slightly upstream, throw in an upstream mend to allow the lure to hit the bottom, wind up tight and let the current bounce it around in an arc to the near shore. As Jo Seager (a local chef) would say “Easy peasy”. I nodded off on Saturday night best pleased and dreaming of the carnage that was about to ensue at dawn on Sunday morning. As you do. And, as so often happens, reality collapses under the weight of expectation. Not a bean. Had the tails nipped off twice by YEM’s (I actually watched them do it in the shallows the second time) but of the snapper there was no sign. My theory is that the fish started feeding as the tide reached its lowest ebb on Saturday night and then followed the incoming tide onto the flats in the dark to gorge themselves. They returned to the main channel with Sunday morning’s ebb tide fully satiated. Hence the lack of action. I suspect that over the summer, especially when there are a lot of people around, the fish become nocturnal and hide out in the deeper holes under the moored launches during the day. This phenomenon has happened to me before. All on just before dark and “dead as a nit” the next morning at the same stage of the tide. Change of light works but only at dusk. Any comments? There was a noticeable difference in the tidal flow on Sunday morning. It was a higher low than the night before. I bet the fish moved off the flats fairly late as they had time and water depth on their side. I’ve run out of jig heads now as I lost four. Bloody horse mussels!!! I’ve ordered 16 jig heads more (the ¼ oz. 1/0 hook size is way smaller than what is routinely stocked) along with 3 dozen Binsky blades from USA. I’m getting the boat ready for Tapuaetahi and have to fix a net and make a short long line this weekend. I wouldn't mind catching the odd snapper - if they were here. Having said that, according to Alan, the conditions are not always good in New Zealand either. So, We're off to have a cuddle of our new granddaughter in Brazil soon it will be a few weeks before I can post another report. Hopefully the fishing will be better by then.